The perfect light dinner or fresh starter for spring and summer gatherings. We are always on the lookout for delicious dinners that look impressive enough to be served at a dinner party… and that don’t always make meat the focus! 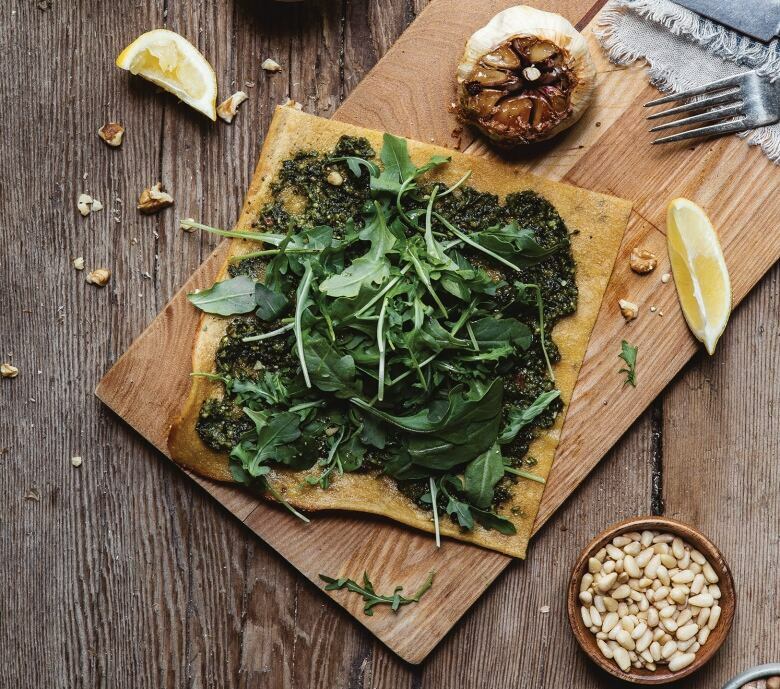 That’s what drew us to this green and gorgeous socca (think of it as a chickpea flatbread or pancake) with pesto and greens from The Greenhouse Cookbook. You can make it at any time of year but this light dinner or fresh starter is absolutely right for your spring and summer gatherings. Socca, also known as farinata, is a kind of flatbread made from chickpea flour that’s popular across Italy and in the south of France. It is sometimes baked in a pizza oven, sometimes in a cast-iron pan and sometimes on a rimmed baking sheet or dish — use what’s available to you. It pairs perfectly with a smear of pesto, a pile of arugula, some cherry tomatoes and perhaps a few slices of buffalo mozzarella. Begin by making the batter for the socca; it needs time to sit. In a large bowl, combine the flour with the salt and black pepper. Vigorously whisk in the water to avoid clumping. It should have the consistency of cream. Cover with a tea towel and let sit at room temperature for a minimum of an hour, or overnight. Once the batter has rested, preheat the oven to 425°F. Grease a rimmed 11 × 17-inch baking sheet with olive oil. Whisk the batter and pour it into the baking sheet (it should be about ⅛ to ¼ inch thick). Bake for 20 minutes, or until the batter has set. Broil for another 5 minutes, until the top is golden and crisp. Check often to avoid burning. While the socca is baking, prepare the pesto. Wash the basil and remove the stems. In a food processor, combine the basil leaves, walnuts, olive oil, nutritional yeast, garlic, lemon juice, salt and pepper. Blend on low, then increase speed to medium for about 40 seconds. Once the socca is done, remove it from the oven and let it cool. Slice it into large triangles or squares and carefully remove each piece using a spatula. To serve, smear pesto onto each slice. Add a small handful of arugula on top of the pesto, a drizzle of olive oil, some sliced cherry tomatoes (if using), a crack of black pepper and a squeeze of lemon.